Amongst the pioneers who developed formats for home entertainment, MusicNow made their mark with impressive CD-extras featuring British composers Brian Dennisand Hugh Shrapnel. Orpheus, their latest CD-extra, is aimed towards schools and youth theatre companies; a new musical for children themselves to perform. It is supplied with extensive CD-ROM material including printable scores and teachers notes, devised to encourage new productions by any organisation, however limited its resources – it is designed to accommodate even schools which have no music teachers, sadly not uncommon nowadays in UK. 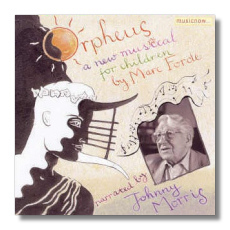 Mark Forde began to write Orpheus in 1994 "after getting fed up with being asked to accompany the same handful of schools' musicals that had been performed since the 1960s/70s". Teachers confirmed that they had problems finding new music that was challenging and fun to perform, especially for the older children. This project, based on an imperishable and popular myth, deserves to break national boundaries. Orpheus is conceived as an open ended project to be created and developed anew every time. With Acrobat and Windows Media Player installed on your computer, you can simultaneously listen and view the material in any number of ways. It is realised on this inviting CD-extra by children from the Balagan Theatre Company in Lambeth, with Johnny Morris as the narrator. Balagan, directed by Marc Forde, aims to encourage young people to participate in music and drama, and to disseminate new musicals for schools. Forde's music is deliberately straightforward, in a familiar idiom which should appeal to most schoolchildren. Click here to listen to samples of the music and the late Johnny Morris's delightful narration. The production of this delectable disc, packed with imaginative features, is highly sophisticated. Quite apart from its essential purpos, exploring the features will also give pleasure to computer enthusiasts, teachers and children alike – probably the kids will assist their teachers to navigate the programme, as our grandson helped me!